Why do so many photographers keep their rates a secret on their website? Because they want to have the chance to talk to you — and then negotiate if their rates are higher than what you are willing to pay. I’m not going to waste your time. These are my rates. Yes, I am negotiable depending on your needs. And I also run promotions fairly regularly. You will find no hype or sales pitch here. Quite the opposite, actually. My work is not for everyone and I reserve the right to decline your request to work together. This doesn’t mean I won’t work with you, but it does mean that if I think what you are looking for could be better served by someone else, I will recommend that you work with them instead. I’ve had people offer to fly in from far-away places or make a 5 hour road trip to shoot with me — and if you do that, I’m going to tell you that there have to be talented photographers in your area who love your business. I want you to want to work with me because that’s what you want. And if you ultimately decide you want to work together, we’ll both be happier that way. If you end up with questions after reading this page, don’t hesitate to contact me and I promise I won’t try to sell you anything. Los Angeles photographers typically charge by “the look” these days. I don’t. I think it’s a bad deal for clients. I charge by hours of shooting time. My standard rates start at $500 for a 2-hour session and get progressively better depending on how many hours you book (3 hours = $650, 4 hours = $700). 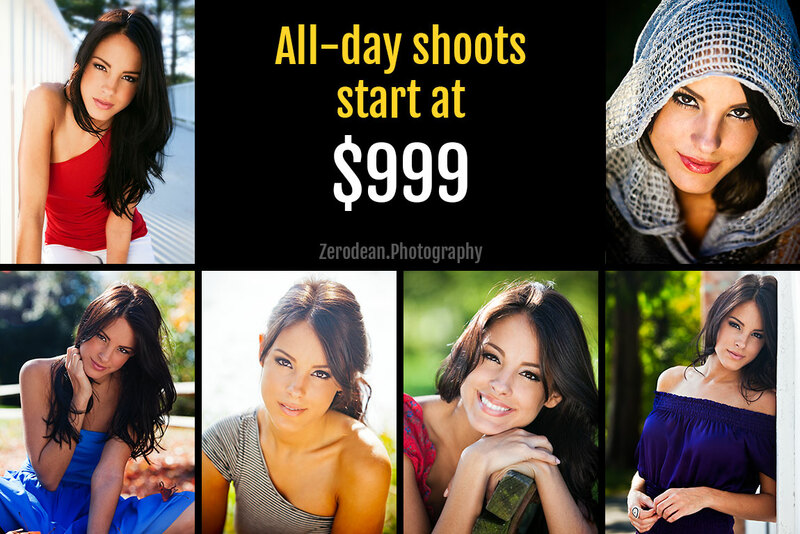 A scheduling deposit is required to book your shoot (see section below). My rates are negotiable based on concept, location & experience. Contact me to discuss your specific situation or ideas. 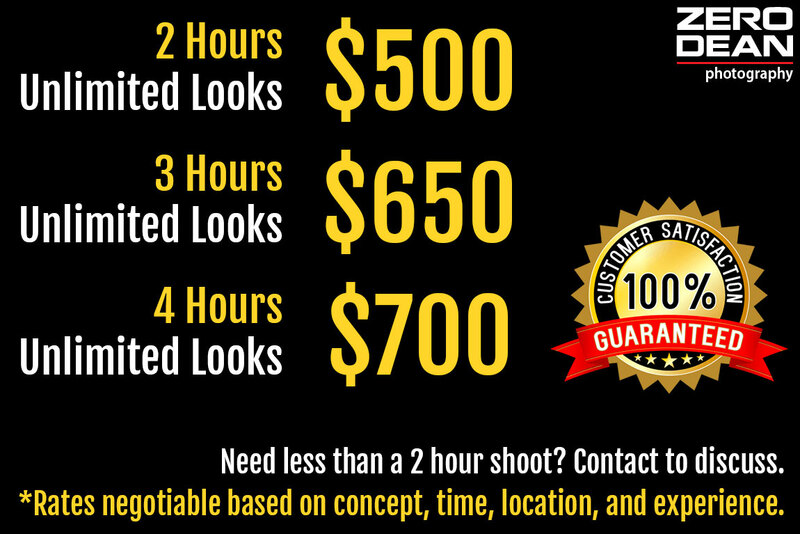 My rates apply to all shoot types, whether you need actor headshots or a modeling portfolio or anything else. I provide portraits for any purpose. I only schedule shoots for less that 2 hours in length under special circumstances — or if I’ve worked with the person before. This is for your benefit, not mine. No matter how much experience a person has, I consistently find that the most natural photos tend to come later in a shoot. If you need an exception and would like to make a case for scheduling less than 2 hours, contact me. I schedule only one person per day. You are not part of an assembly line. When we shoot, it’s just you. You have my full attention and we are not rushed for time. This allows photoshoots to occasionally run long at no additional cost to clients. A minimum of 3 are provided regardless of how many we take. In the unlikely event that you’re not thrilled with your photos, we’ll shoot again until you are. In the event that I’m not thrilled with your photos for some reason (even if you are), I will offer to shoot with you again at no cost. Providing the best services I can is important to me. I don’t do this for the money. You pay for the best services I can provide and I want to make sure you get them. I occasionally offer additional discounts based on the circumstances, opportunity, or if shooting is mutually beneficial. Check my instagram to see if I’m offering a special. All shoots require a $75 deposit to book. This is deducted from the cost of your shoot. If you cancel your shoot up to 7 days before your appointment, your deposit will be refunded. If you cancel your shoot less than 7 days before it is scheduled, your scheduling deposit will not be refunded. Rather than cancel, you can reschedule your shoot up to 3 days before your appointment for an additional deposit of $75 — for a total of $150 that will be deducted from the cost of your photoshoot. If you choose not to reschedule, your deposit will not be refunded. You have up to 3 days before your appointment to reschedule your appointment without a penalty. After that, your original deposit will not be refunded. However, you may still reschedule your appointment by making another $75 deposit. The scheduling deposit is an unfortunate necessity after a number of last minute cancellations. Imagine me driving from San Diego to Los Angeles to work with someone only to have them cancel on the day they are scheduled. It’s happened. I will work to the best of my abilities to serve you and provide you with an experience that exceeds your expectations. I want to deliver to you the type of quality services and photography that will make you want to rave to your friends about how great it was. I provide professional portraits for any purpose. I shoot a lot of headshots for actors, entertainers, athletes, performers, realtors, and more (and wrote extensively about it in 2006). I’ve also spent a fair bit of my career helping aspiring and established models add to or build their portfolios. I also provide guidance to new models with regard to everything from posing to career choices. I’ve written about that as well. Promotional portraits for your campaign, book cover, website, fan page or social networking profile, whatever you want! I am a natural & available light photographer. This means for 99% of my work, I don’t work in a studio or use studio lighting. Instead, I work on location and control and modify the light that exists in the shooting environment to get the look I want. I provide coaching & direction with every photo shoot to help you get the best photos possible. I specialize in getting great shots (and portraits) from subjects who are shy or generally don’t like to have their photo taken or new models just beginning to build their modeling portfolios. Are not included in my photo shoot packages. As much as I love and value working with make-up artists, I prefer to work with them on a shoot-by-shoot basis so that my clients will be able to take full advantage of their services as necessary. In order to take full advantage of a make-up artist and to get the most out of your scheduled shoot time, I recommend that you arrange to meet with the make-up artist (and/or hair stylist) at your home 30-60 minutes in advance of your appointment and have your initial application of make-up done before you arrive at your shoot. This will minimize the amount of make-up done on location and will also allow us to begin shooting sooner. When shooting on location, if you wish to have your make-up done in advance of your appointment, but also altered during your shoot, it is important that you hire someone who is able to both meet you in advance of your shoot (either at your place or theirs) and who is then also available to work with you at the shoot location. The answer to commonly asked questions are available on my Frequently Asked Questions page. If your question isn’t answered there, please don’t hesitate to contact me. Model portfolios and model headshots in Los Angeles, Santa Monica, San Diego (and everywhere in between). And throughout southern California and nationwide by request.